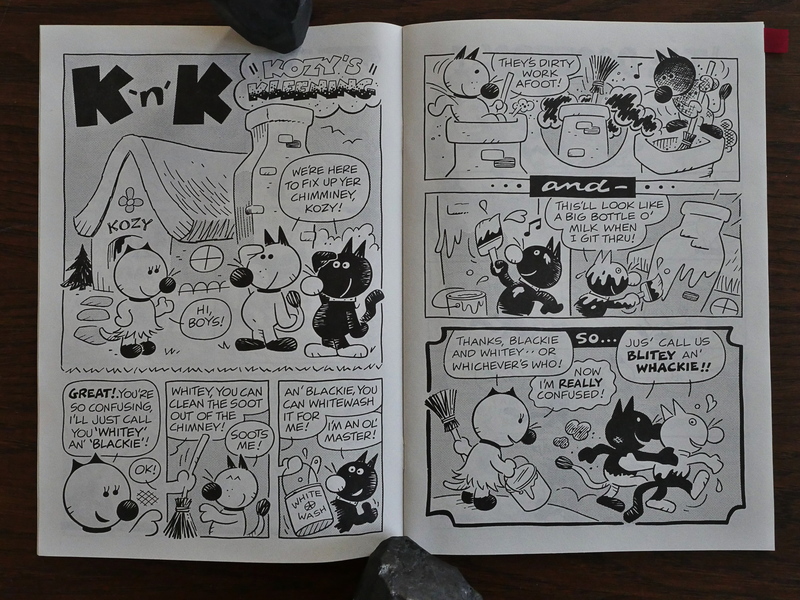 Kitz ‘n’ Katz Komiks (1986) #1-4 by Bob Laughlin. The black-and-white boom was getting underway and would come to set its mark on Eclipse over the next year or so. Eclipse’s first “boom” book, Adolescent Radiactive etc. was a commercial success, but I would guess that this wasn’t. Anyway, each issue has a bundle of unconnected one-to-fourish page stories about these characters. 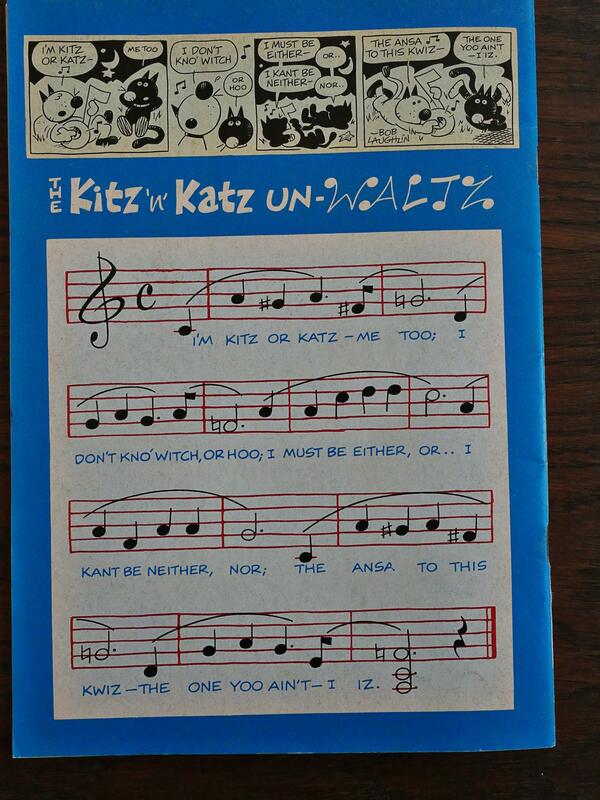 Kitz ‘n’ Katz is, of course, somewhat a riff on Krazy Kat. 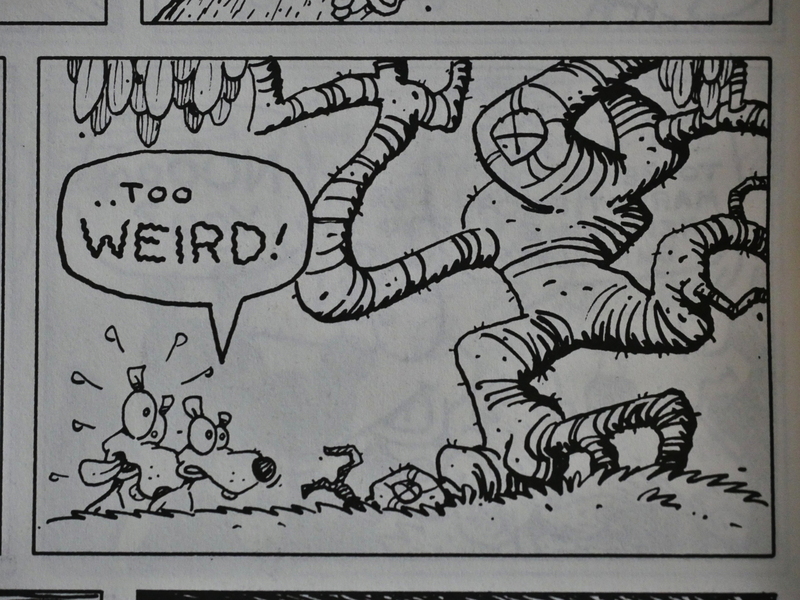 But while Herriman made something really special and interesting, this… isn’t. 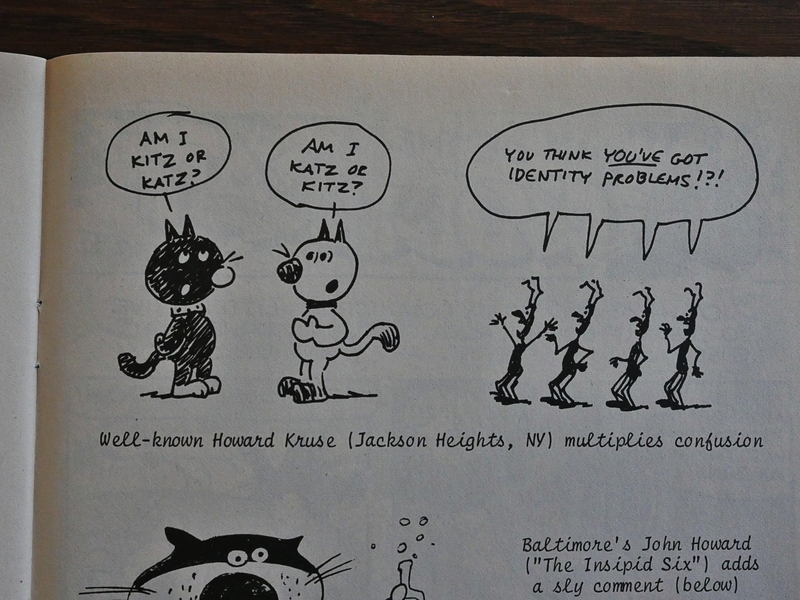 Herriman would do great riffs on race and gender, and the “is Krazy or not?” thing is reflected in nobody (including Kitz and Katz) knowing which one is which. 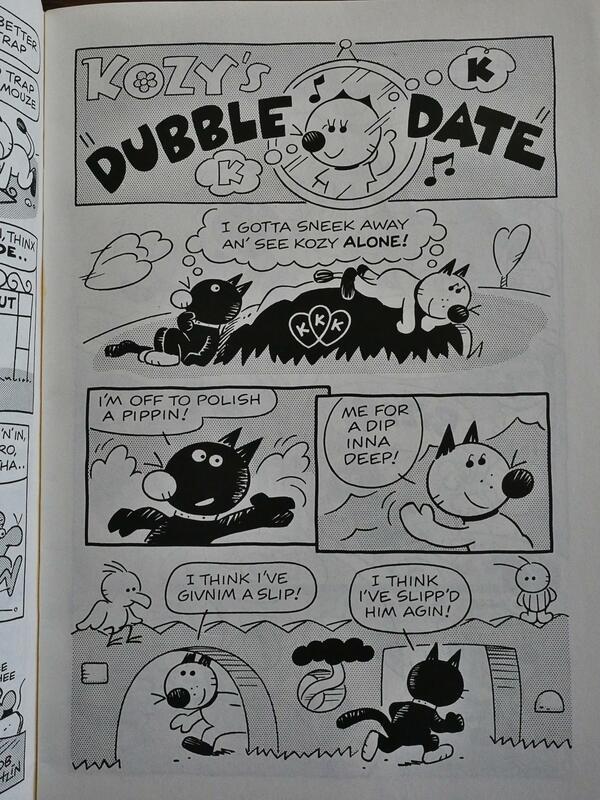 So you’d think that in a strip like this where this is made explicit with “Whitey” and “Blackie” (! 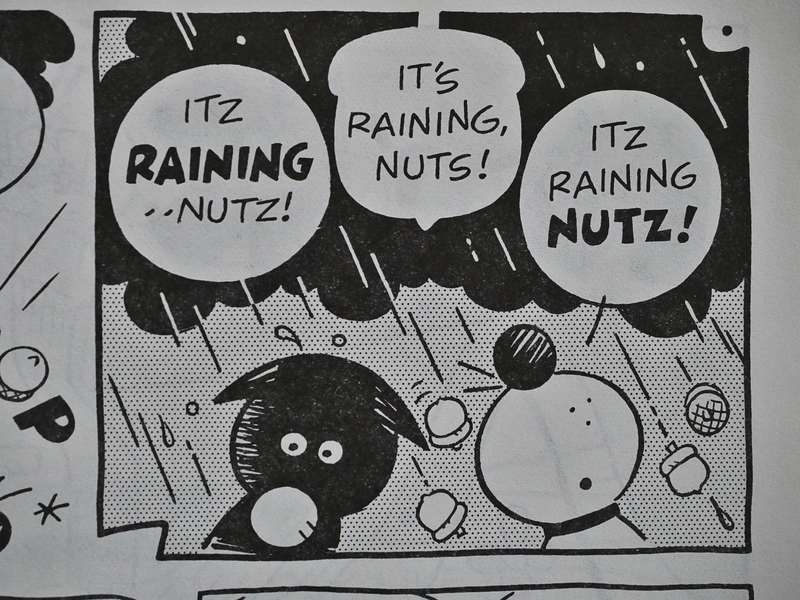 ), you’d see something beyond this gag, but… no. 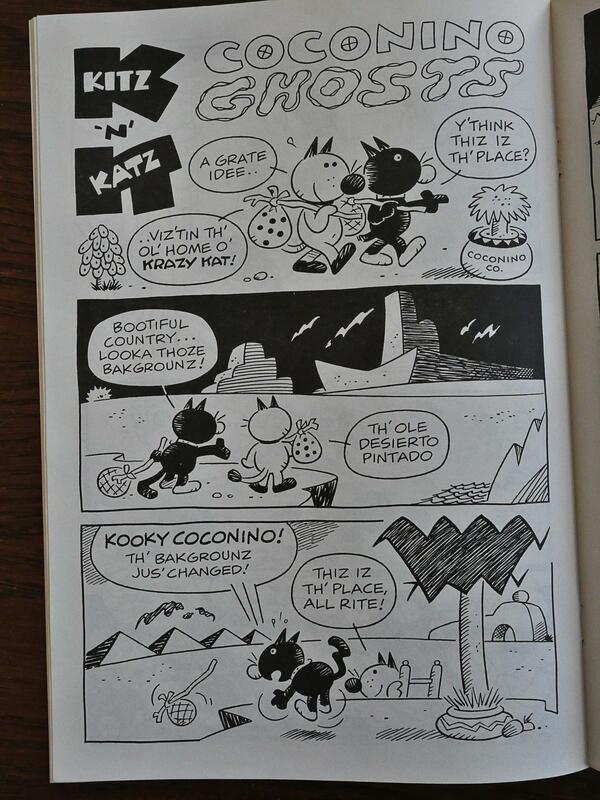 And speaking of implicit made explicit: Here Laughlin takes a trip to Coconino county. It’s a rather nice homage, and probably the best thing from Laughlin in these issues. Because he’s got plenty of guests showing up for a few pages each. 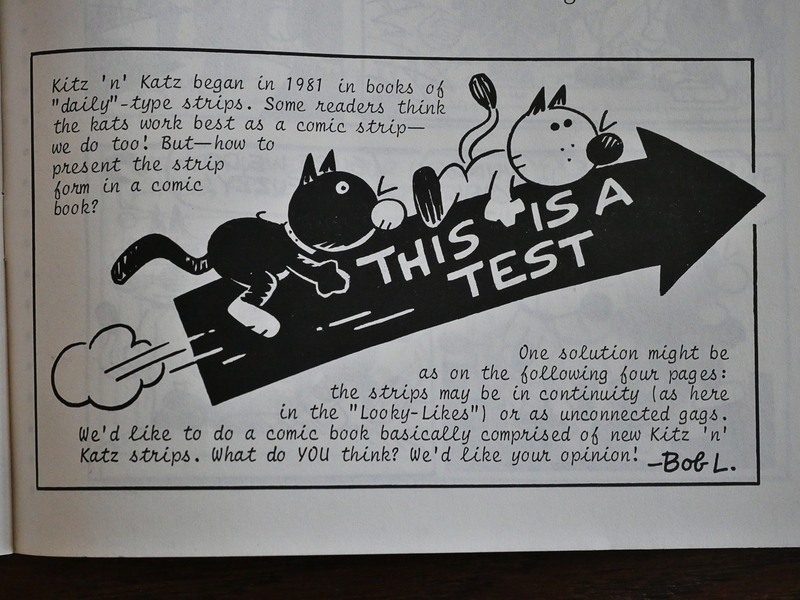 Only one of them does some things within the Kitz ‘n’ Katz universe: Patrick McDonnell, who wrote a book on Krazy Kat, but is most well-known for his long-running Mutts daily strip. This is very early McDonnell, though, and looks kinda punk. Err… That Kozy/Kitz/Katz heart thing is probably… Ok, let’s skip it. But I wanted to mention that while Laughlin’s inspiration Herriman used dialect for fun and characterisation, Laughlin basically just does a “phonetic” spelling of non-distinctive American English. Is it supposed to be New Jersey or something? All the characters speak the same way (and none of the supporting characters have any distinctive personalities), so it’s all rather a waste. 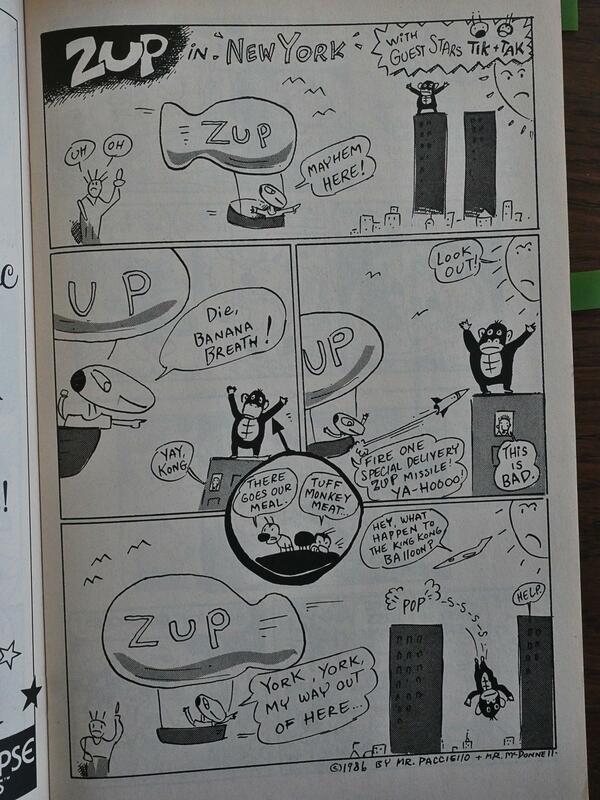 George Erling is the other artist to have some pages in each issue, and they’re kinda fun. … to something that resembles a stab at an actual joke, like the above. Which I’ve never seen before, and probably for good reasons. One strip across the top, and then two strips arranged as a square in the bottom. There’s music, too. Somebody should release a MIDI version of the score. There’s no letters page as such, but Arn Saba (of Neil the Horse fame) drops by to say that he quite likes the book. The Patrick McDonnell strips grow increasingly weird. They’re written by “Mr. Paciello” and rather reminds me of the lunacy of Mark Marek. Eclipse switches the book to newsprint at this point, which makes it look even more new wave. Unfortunately Gary Fields provides a couple of pieces. The final issue is even more scattered than the previous ones, and there’s a general feeling of scraping the barrel here. 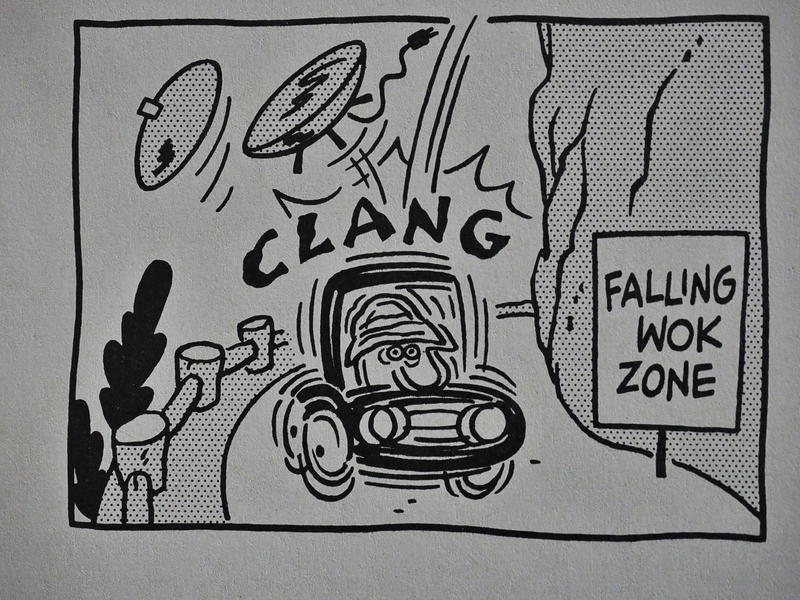 The pages of these one-panel gags aren’t even the worst thing in here. 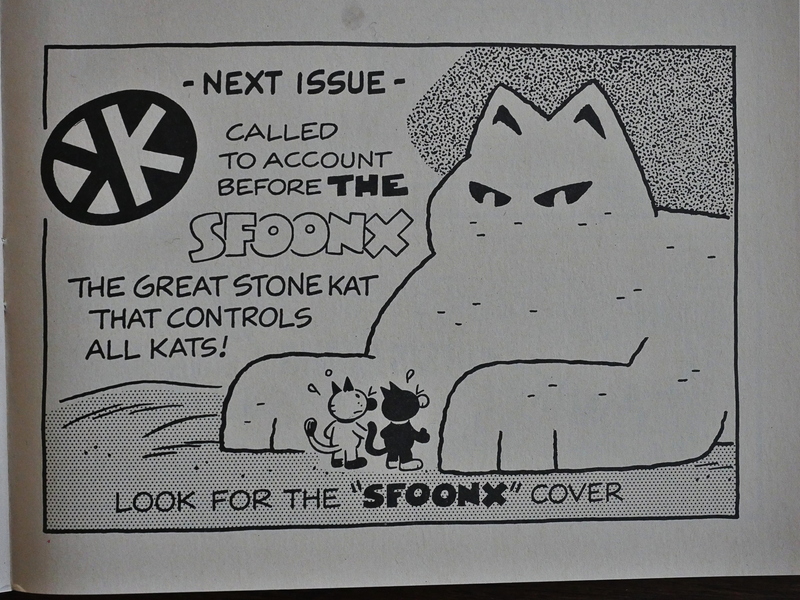 And then we get the first “next issue” thing, and it is, of course, in the final issue. 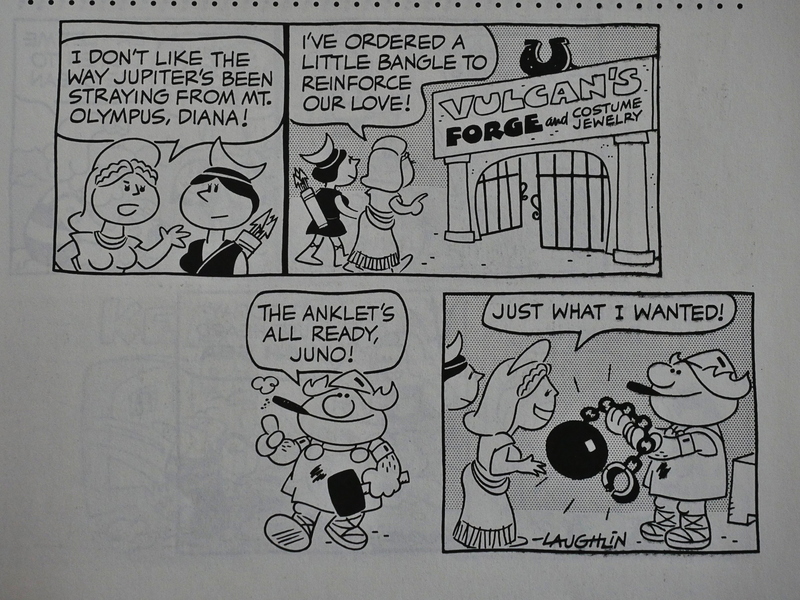 Laughlin self-published one issue after Eclipse cancelled it. 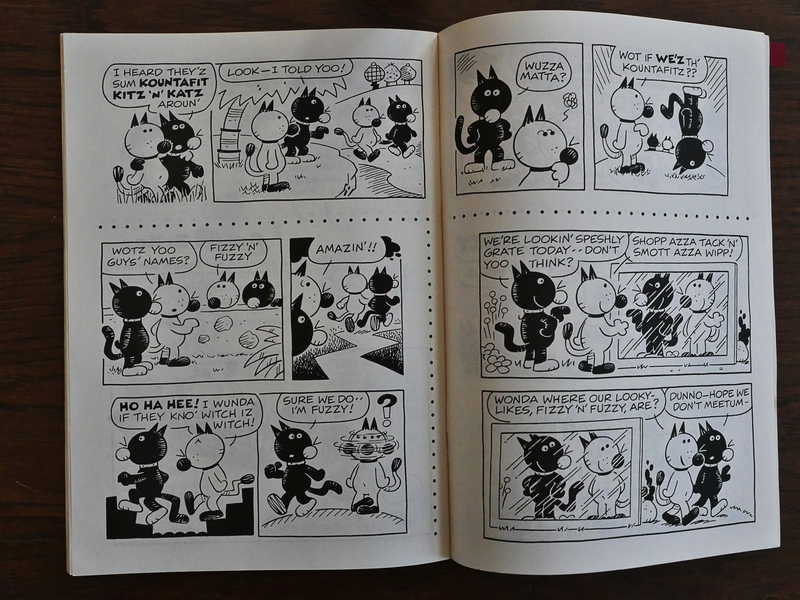 Now, I knew nothing about Laughlin before reading this series, but it turns out that he’s a veteran artist having had his own short-lived comic strip in the 60s (Cuffy), and worked as the inker on the Heathcliff comic strip for ages. 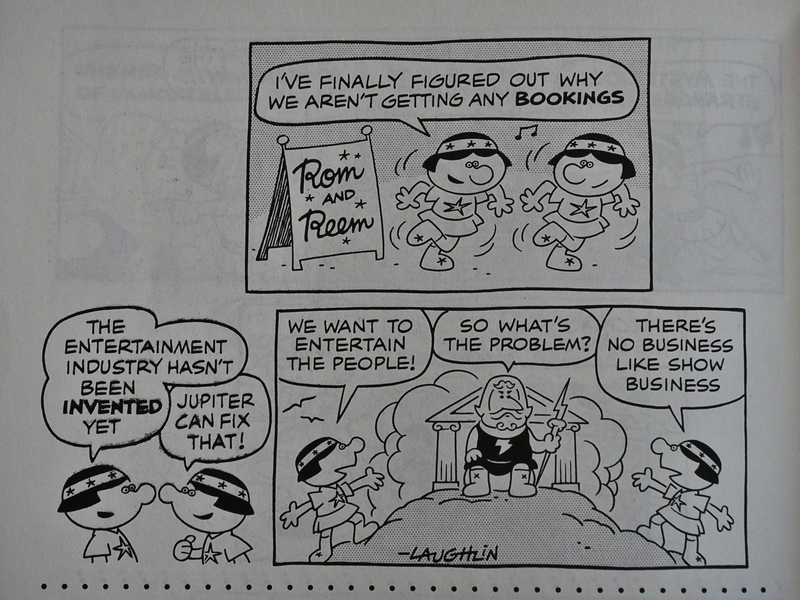 Laughlin seems to have attempted a genuine funny-animal book with no apologies or equivocations made for the fact, and while he would undoubtedly describe his intended audience as the cliched kids-of-all-ages, the unadorned art style and primer-level humor featured in the book indicates that would work best for the most-ignored minority in comics today, namely, little kids. 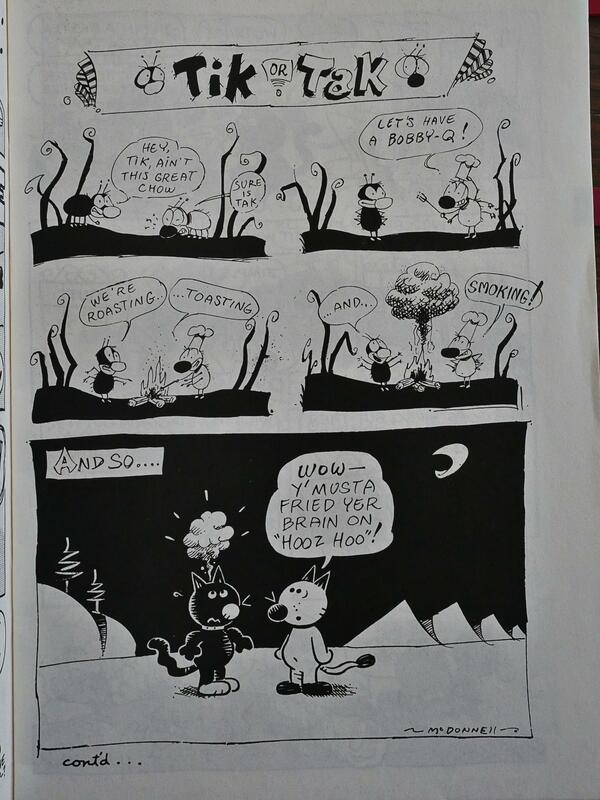 But that is precisely where the book runs into trouble, because Laughlin, through his Krazy Kat fixation, presents stories that would leave most kids cold as well as dialogue, written in a quasi-Krazy phonetical manner, that would probably only confuse them. Anyone older would find both tedious. Er… What? 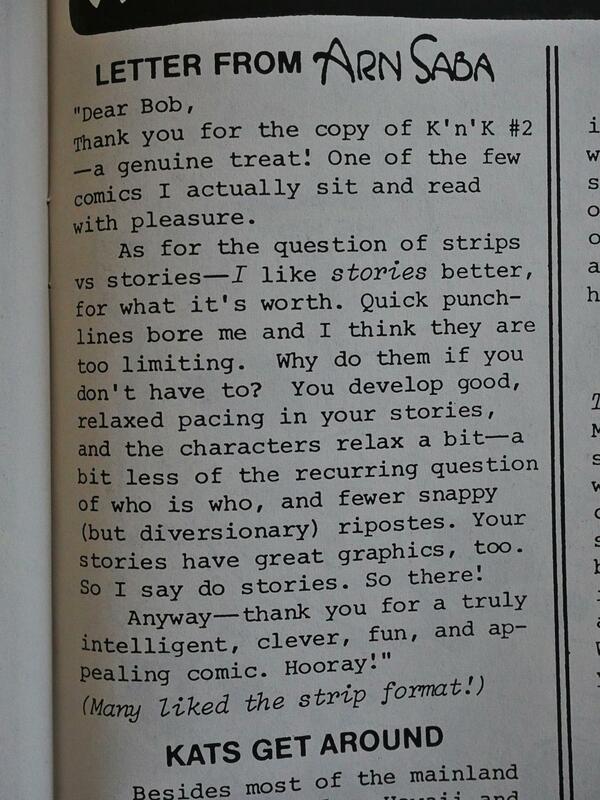 Is he saying that older readers find Krazy Kat tedious? 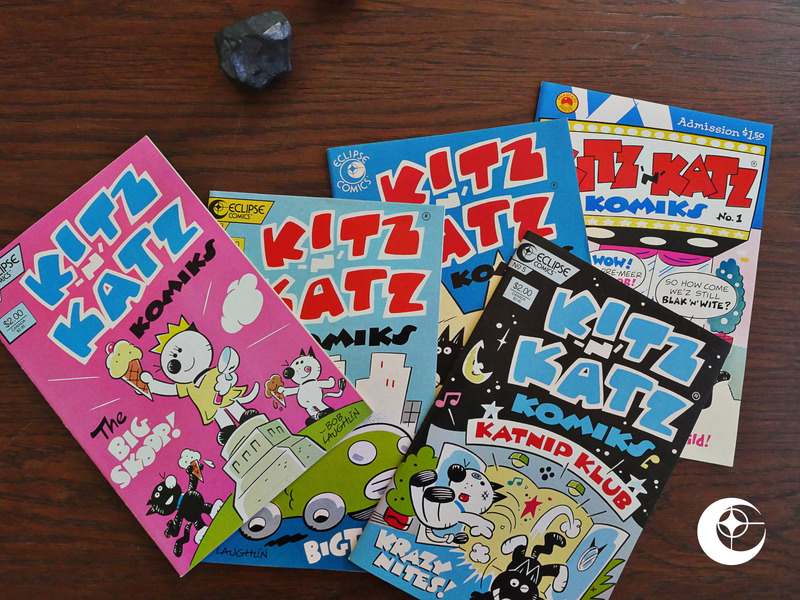 I was very happy to publish Kitz ‘n’ Katz #1 as the first full size comic for Phantasy Press. This brings back memories. I also printed Zot 10 1/2 for Eclipse. I am currently printing more comics than ever for primarily local creators. Fun.